Personal Mode support for national clouds. Improved Gateway Configuration Experience for Personal Mode. Updated version of the Mashup Engine. You can download this new version and continue reading below for more details about each enhancement. 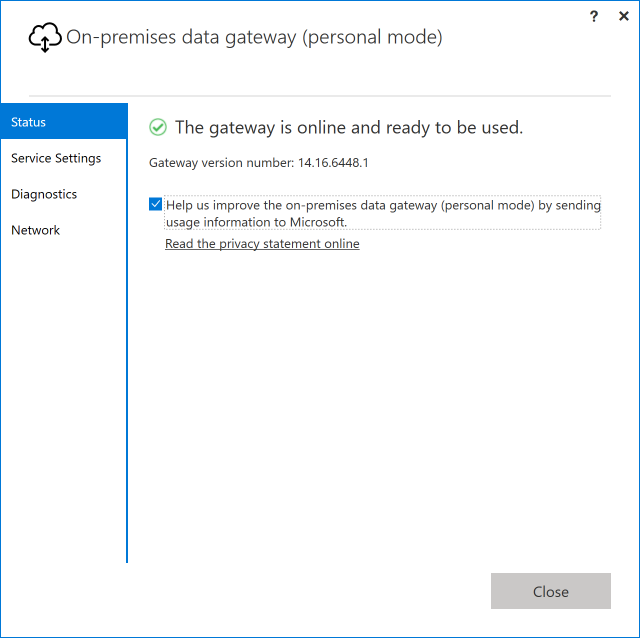 We have improved the Configuration experience for the On-premises data gateway when running in Personal mode. This experience matches the existing one for Enterprise mode, including Status, Service Settings, Diagnostics and Network configuration options. Last but not least, this Gateway update includes the same version of the Mashup Engine as the Power BI Desktop update released last week. This will ensure that the reports that you publish to the Power BI Service and refresh via the Gateway will go through the same query execution logic/runtime as in the latest Power BI Desktop version. Note that there are some Beta connectors (such as Spark) still not supported outside of Power BI Desktop. Please refer to specific connector documentation for more details or contact us if you have any questions.